Former Mizzou Football center A.J. Ricker will rejoin the team as an assistant offensive line coach a decade after graduating, Head Coach Gary Pinkel announced Monday. 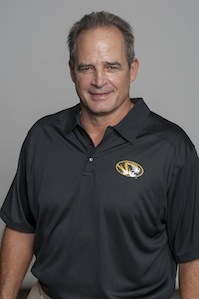 Ricker is replacing assistant coach Bruce Walker, who retired from Mizzou earlier this month. Ricker played for the Tigers from 2000-2003 and served as captain for two years. Throughout his college career he started 47 consecutive games as a center. This streak began Mizzou’s record for most games started in a row at any position. He now stands fifth overall in the team’s consecutive start chart and second among centers. During his senior season he was a 1st-Team All-Big 12 center as part of Mizzou’s first bowl-eligible team since 1998. Ricker is only the second former football Tiger to rejoin the team as a full-time assistant coach. The other is Matt Eberflus, who coached at Mizzou from 2001-2008. Ricker is thrilled to be back coaching at his alma mater, although he’s not letting any nostalgia disrupt his focus on coaching. After graduating from the University of Missouri in 2004 with a degree in agriculture, Ricker signed a free agent contract with the Chicago Bears. He then played for the Arena Football League’s Tampa Bay Storm in 2006 and 2007 before he retired from playing. He began his coaching career in 2006 as a graduate assistant at Western Michigan and was promoted to full-time offensive line coach after two seasons. He then moved to St. Joseph’s College in Rensselaer, Ind., where he was the offensive line coach in 2009 and the team’s head coach in 2010. He went back to WMU for the next two seasons as offensive line coordinator and run game coordinator. Ricker spent last season as the offensive line coach at the University of Illinois. Ricker was born in Windsor, Mo., and graduated high school in Klein, Texas. He and his wife, Lauren, have an infant son named Andrew.